Pancakes here… Pancakes there… Pancakes for everyone! Step 1. Making the pancake batter – Measure out all of your ingredients using a set of kitchen scales. Crack two eggs into your mixing bowl, add the flour and milk. Whisk until the mixture is smooth. Step 3. Adding the zest – Simply cut the blood orange into two halves. Grate the peel from one half of the blood orange into the melted chocolate and stir until completely mixed. Step 4. Making the pancake – Using a ladle, pour the pancake mix into the centre of your Pancake Pan. Tilt the pan slightly so that the mixture spreads around the edge of the pan. Flip the pancake over occasionally to make sure that both sides are cooked evenly. Step 5. 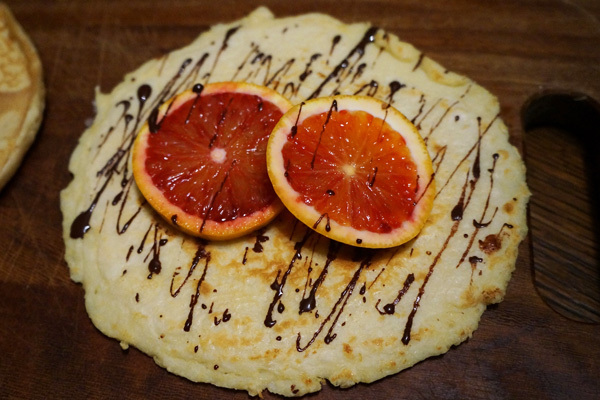 Final touches – Drizzle the chocolate over your pancakes, along with a small trickle of juice from the remainder of your blood orange. Step 2. Making the pancake – Using a ladle, pour the pancake mix into the centre of your Pancake Pan. Tilt the pan slightly so that the mixture spreads around the edge of the pan. Flip the pancake over occasionally to make sure that both sides are cooked evenly. Step 3. Scrambling the eggs – Over a medium heat, crack two eggs into a saucepan, add a dash of double cream and the black pepper. Keep stirring the mixture until you are happy with the consistency of your scrambled eggs. 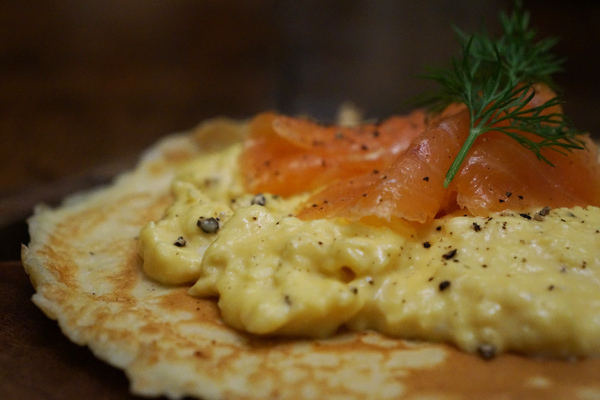 Step 4: Final touches – Scoop your scrambled eggs onto your pancake and add the strips of salmon on top. Present with a sprig of dill. Or why not just go all out and make both? Blood Orange, Chocolate, Crepe, Pancake Day, Pancakes, Philip Morris And Son, Recipe, Savory, Scrambled Egg, Smoked Salmon, Sweet. Bookmark.